And the very sweet Su-sy is a perfect tangle to start out our brand new year especially for new tanglers joining our community. Not only is Su-sy super easy, it’s fun, it’s pretty, and it can grow just as big as you like. Su-sy is from “the olden days” of Zentangle® and the beginning of TanglePatterns.com way back in 2010. Yes indeed, 8 years ago! 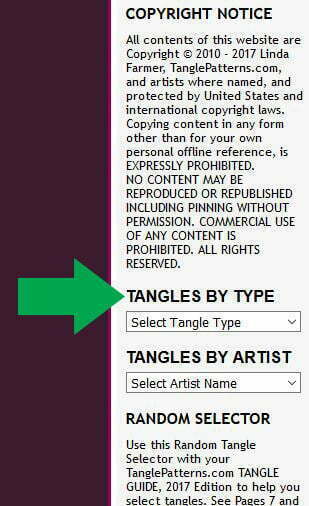 It’s from Livia Chua who has thirteen more tangles on the site. Livia is from Southeast Asia and it’s been quite a while since we’ve heard from her but her wonderful tangles carry on. Livia deconstructed Warped Eggs which was her first tangle on the site. There a few tanglers in the world whose unique style you instantly recognize, and Livia is certainly one. Her whimsy and penwork are unmistakable. I was reminded of Livia’s tangle by a couple of recently-submitted tangles. At the time Livia published it on flickr in 2010 I thought it was very similar to CZT Sandy Bartholomew’s Mumsy from her Yoga For Your Brain book. Mumsy didn’t appear online until the next year. JJ LaBarbera’s Arc Flower is another similar tangle in this radial-style or organic tangle family. Livia illustrates the step-by-step instructions for drawing Su-sy here on her flickr account where you’ll find it paired up with her Pea-Pops tangle which appeared about the same time as CZT Carole Ohl’s Inapod. Carole’s tangle was added to the site before I’d seen Livia’s, so because of the similarity Pea-Pops isn’t here on the site. Hi, love your site. Look forward to seeing your email in my inbox. A fun and easy way to start the new year. Thanks for what you do Linda. Look forward to your emails every day and makes me take a little time to tangle. Indeed an uncomplicated but very nice pattern. Thank you very much!